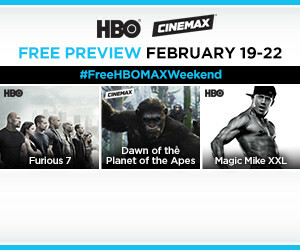 Starting Friday at 6 a.m., we will be offering a free weekend preview of HBO® and Cinemax® to all of our TDS TV customers. Don’t miss the Season 6 premiere of Game of Thrones on April 24. Follow the 2016 presidential election on Last Week Tonight with John Oliver. Get in-depth investigative sports analysis from Real Sports with Bryant Gumbel. And with HBO On Demand, viewers have full access to the best of HBO’s massive content library. Relive your single days through Entourage or indulge in one of HBO’s fantastic past miniseries such as Band of Brothers, The Pacific and John Adams. Call us now at 855.612.0115 to secure HBO and Cinemax for half price for the next 12 months! Free preview: Set-top box reboot may be required to view free-preview programming. Parental controls can be set to restrict or filter free-preview programming. To receive HD preview channels, an HD subscription is required. Recorded free-preview content disappears when the free preview ends. HBO/Cinemax half-price offer ends 4/3/16: Valid for new subscriptions only. After 12 months, current rates apply. HD premium channels require an HD programming subscription. Local and state sales tax and other fees and charges may apply. HBO®, Cinemax® and related channels and service marks are the property of Home Box Office, Inc.